Whether only sparring or actually facing up to a fight opponent the nature of the sport means that the potential for injury is high. Even sport pioneers such as Joe Lewis and Bruce Lee couldn’t escape the wrath of a kickboxing injury. Preparing well for the sport can help in avoiding this wrath, however, unfortunately no matter how well prepared you are, an unexpected kick, upper cut or jab from an opponent can still result in an injury. The Physical Therapists at MountainTop Physical Therapy and Wellness Center are highly skilled in many types of injuries and are eager to provide treatment for any kickboxing injury you may incur. This part of our website is designed to help you prepare to participate in kickboxing, particularly if you are just new to the sport. 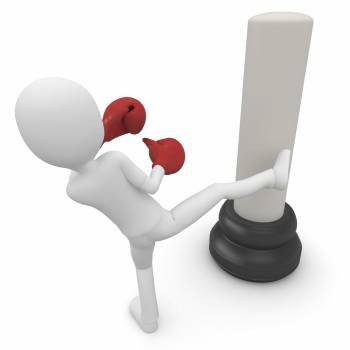 With the following resources, it is our aim at MountainTop Physical Therapy and Wellness Center to help you choose the right equipment to get you started, to learn about the most common kickboxing injuries, and to assist you in preparing your body to partake in the sport. Good luck and may the best fighter win... and end up with fewer injuries!